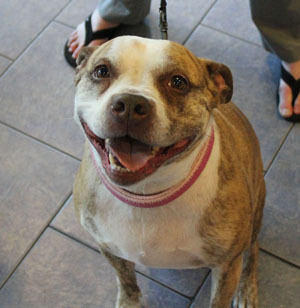 Panda, a 6 year old Pit Bull mix, suddenly became weak in the back legs, unable to walk normally. An MRI was recommended to confirm the suspicion of a problem in her spine such as a slipped disc. Despite her financial concerns, the owner elected to do the MRI. Our radiologist thought that the problem was more likely to be a tumor than a slipped disc. Surgery would be needed to relieve the pressure on the spinal cord. After surgery, chemotherapy and/or radiation therapy would possibly be recommended to further help Panda depending on what kind of tumor the biopsy revealed. Her young daughter had come along, and the two of them were in tears, not knowing what to do. They clearly loved their dog. But spinal surgery is not exactly cheap. And they didn’t have pet insurance. After a long heart-to-heart, they decided to give Panda every chance they could and elected surgery, which we performed that night. The spinal cord is an extremely sensitive organ, which I always compare to an eyeball (now is not the time to shake). Panda was still able to walk. A little bit too much trauma to the spinal cord, and she could become paralyzed - temporary or permanently. The mass, found right along the spinal cord, was removed carefully. It was fragile and somewhat chalky. We eventually were able to remove it safely. It was sent to the lab for analysis. A week later, the biopsy results arrived. The mass, presumed to be a tumor, turned out to be… a slipped disc! The chalky appearance was due to calcium deposits in the disc. The owners - and myself - were thrilled by the good news, and Panda made a full recovery over the next few weeks. What if the lady had chosen to euthanize Panda? What if their family vet had recommended euthanasia? What if the lady had met another surgeon, who was not as willing to perform surgery? What if the owner’s husband had been available, and he had chosen euthanasia? What if the daughter hadn't begged her Mom to give Panda every chance? Incidentally, the radiologist was an excellent one. I work with him all the time and I trust his judgment. He gave his opinion based on MRI pictures he reviewed. But radiology, like surgery, is not an exact science. We all make mistakes.